Once there was an Akita named Kaya. The burly dog had dry, sensitive paw pads and walked around in discomfort, especially in the winter when the sting of salt and ice made things worse. Luckily for Kaya, she lived with Sara Tryzelaar, owner of Rooted Earth Farm in Casco, where Tryzelaar and her partner grow herbs for use in natural body products and herbal apothecary goods. The 5-acre farm follows sustainable practices, using no pesticides, herbicides or chemicals – not even organic ones. Kaya inspired Tryzelaar to move beyond the tinctures, teas and salves she makes for people and concoct something special for her dog that would soothe her paws not only in winter but on the hot pavement of summer as well. The result was her “Paw Protector” balm for dogs. It contains chamomile and calendula, known to be soothing to irritated and dry skin, as well as shea butter, beeswax and coconut oil. Unfortunately, Kaya has since crossed over the Rainbow Bridge. But Tryzelaar has discovered the Paw Protector also helps her new canine companion, Charlie – a chihuahua who gets dry patches on his skin. The balm is safe for humans, so skin care can become another activity to share with your dog. 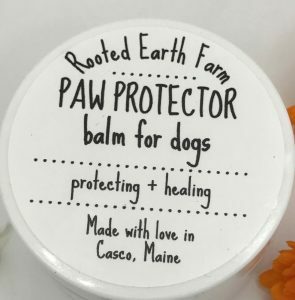 And it’s no problem if your dog likes to lick his paws occasionally – everything in the balm is edible. A 1-ounce jar costs $9; a 2-ounce jar costs $15.50; and a 4-ounce jar costs $23. Paw Protector is available on the farm’s website, rootedearth.com, and on Tryzelaar’s Etsy shop, rootedearth.etsy.com. It can also be found at Bittersweet Barn in Casco, Webbs Mills Eats & Craft Brews in Casco, and EllieAnna Gift Shop in Lewiston.